Oh oh oh we have a special visitor at Thorntown Public Library! Browser the Library Cat is here with us and is exploring my Library! Browser is from the Pine River Public Library in Pine River, Minnesota. He has been a Library Cat even longer than I have! 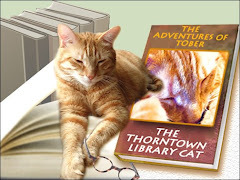 Browser moved into his library in 2002 when he was only nine months old, and he has been there ever since. This summer he is trying to visit as many libraries around the World as he can. Since the summer reading program is "One World, Many Stories," his library people back home are having the children keep track of where he goes. They have a map at the library to track his progress. Don't we make quite the team? I'm thinking of sending the rest of the staff home for the weekend. 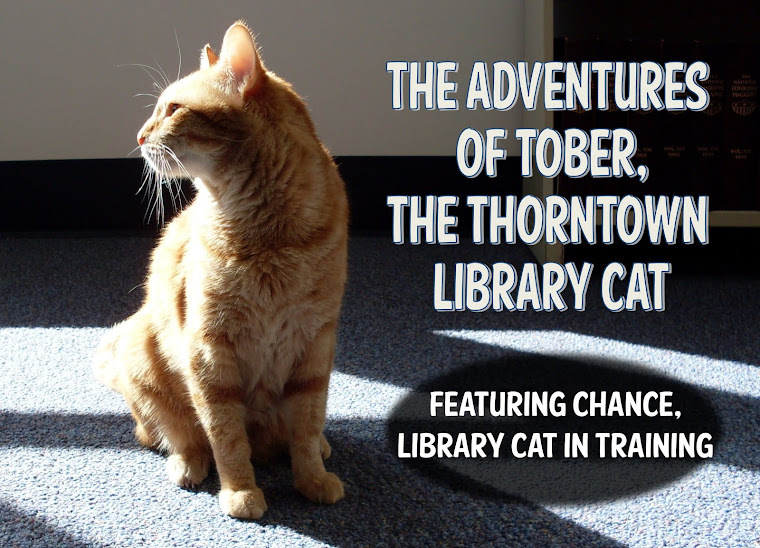 I'm sure one Library Cat per floor can handle things around here! 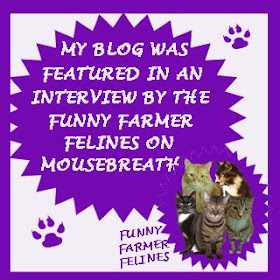 Stop by Browser's blog and leave lots of nice comments for his young readers--I'm sure they'll love to hear the friendly meows from the cat community! PS - My Library has a very exciting new Blog! If you (or your humans) are interested in Young Adult literature, stop by the TPL Teens Blog. It's just a newborn blog right now, but there is much more on the way! AAB Ritchie, despite being a Lergic Allergic, is turning out to be a pretty good Assistant. In the mornings he is the Very First person to come to the Library, which means he has very Important responsibilities. . . like giving me treats. It is good to know that my AABs worry about my happiness and comfort. Just for that, I'm going to leave extra furs on AAB Ritchie's computer monitor. I'm sure he'll be pleasantly surprised. Last night I sent two of my staff people to give a presentation for the Western Boone Education Foundation annual meeting. Judi Hendrix called the library and wanted someone to speak at the meeting. (I'm assuming that she wanted ME Most of All, but I do not leave the Library.) AB Karen is Away "working" and so she asked AABs Christine and Britta to go and represent the Library. From what I understand, they presented a book talk (meaning they yammered on and on for about 30 minutes about--you guessed it--books). Which is great! I love books, and reading is fun and important, especially if you're a Cat looking for Attentions (see my previous post). They talked and talked and talked, and mentioned all sorts of stuff about books, and audiobooks, and MP3 CDs, and OverDrive, and mysteries and Westerns and Christian fiction and suspense and adventure and magazines and nonfiction books and young adult books and Alice in Wonderland. After they were All Done, one of the nice & attentive audience members came up and said "I can't believe you didn't mention Tober." SO FIRED. This is the Most Fired I have ever Fired anyone. I am so Disappointed in my AABs. AAB Christine spends way too much of my time harassing me with a camera and turning me upside-down to FORGET me, and AAB Britta is my Catnip-getter-outer and gives great tummy rubs. Karen is going to be really Sad that these two got Fired, but really, who can blame me? 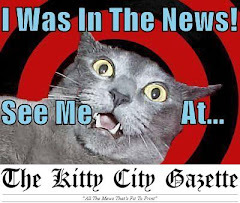 When you're Bossed by a World- and Internet-Famous Cat, you shouldn't really be forgetting him. Especially when the mention of said Cat would bring interestingness, humor, and Class to the presentation. So, yesterday I posted about our Big Ginormous Book Sale at the Library. Apparently Blogger wasn't impressed, because it coughed it right up. So now my Book Sale post is gone Forever. I have asked AAB Christine to be helpful for a change and help me repost it. We have James Patterson books and Nora Roberts books and books with Fabio on the cover. We have Disney VHS movies. We have books for kids of all sizes. We have puzzles and other miscellaneous. (We had to keep the "miscellaneous" stuff away from Ritchie so he doesn't try to stuff it in a drawer and label it.) We have paperbacks and hardcovers and books in large print and also magazines. These things are all available for the low, low price of a Donation! AB Karen requested that I visit for a Special Photo Shoot. This is kind of like how they have a super-famous author come to do a luncheon--AB Karen wanted me to draw people in. That's what I do. It's one of my many duties as Boss Cat. Before any Photo Shoot, though, I need a quick bath to freshen up. One must look one's best for the whole wide Internets. See how Karen is talking and I am only kind of paying attention? That's pretty much how things work between us. Unless she mentions treats or tummy rubs or Catnip. Plus, I already understand how to promote a love of reading! I love reading! Reading is an activity that can guarantee Attention for us cats. It's simple: When you see a human reading a book, go sit on the page that they are most interested in. (You can tell by the staring they do. Sometimes they even point at the page with their fingers.) When you sit on the reading page, they will stop what they're doing and exclaim that you are Handsome (or Beautiful) and Clever, and then they will pet you. And give treats. See how I love Books? If I still had front toenails (which I don't, thanks to the Person Before Karen), that would have really gotten my staff motivated! Thing 1: Mr. Mike Spear refinished two of the wood desks. One of them is not too old, but needed to be prettied up a bit, but the other desk is positively ancient--nearly 100 years old! In cat years, that's. . . that's. . . really old. Ancient! Yes, it looks like a crime scene. Thing 2: Refinishing the old old desk (and the new one) made it Stink to High Heaven. This was a Stink to End All Stinks. Because of the Stink, the staff opened a few windows. I got to smell the Outside while safely Inside! This was a wonderful thing, since I only get to smell the Outside when (a) a People-Counter mistakenly puts me Out twice or (b) I'm being carried to the V-E-T.
Thing 3: AAB Ritchie labeled the tool/"miscellaneous" drawers in the Storage Room. See all those little stickers? Those are the labels. What you can't see is that of the 23 labels, 11 of them say "& MISC." What is Miscellaneous? No one knows. But if we ever need any, we know right where to look! Thing 4: AAB Photographer took a picture of me with huge paws. Also, if you want to make AAB Becki crazy, leave a coffee cup on the corner of the desk. It will drive her nuts! Thing 6: The staff made Fun of AAB Ritchie for his labeling job by labeling his desk for him one evening. You probably can't see, but each sticker says something-or-other & MISC. (!) on it. Thing 7: Mark Twain came to visit the Library! Dave Ehlert, an impressionist who does shows in Branson, MO, performed and 90-minute show about Mark Twain and his interesting life. I hear it was big Fun, although I was NOT invited to show and spent the night feeling quite Neglected. Thing 8: I am such an Important Library Boss that even the contractors who do work at the Library ask after my well-being. John from Precision Control Systems very thoughtfully asked how I was when he last visited. Knowing that I am happy and well-fed helps him to get a good night's sleep. Thing 9: (At this point I'm realizing maybe it wasn't that exciting around here over the last two weeks.) I have learned that the quickest way to motivate my Staff is to approach the Automatic Doors when they are wide Open. This makes them yell "Tober!" and "NO!" and then they lecture me and pet me and give me treats. I have been told Never Never Ever do I go Outside. But since they give me treats when I twitch in the general direction of an open door, I think I'll keep up the ruse. I sit on the landing on the stairs during storms, so that I can be almost Upstairs and almost Downstairs at the same time. That way I'm close to all of my staff at the same time. Thing 11: AAB Photographer took a picture of me being Annoyed. Thing 12: I was encouraged to participate in an Apple Trick photo shoot. The only reason I agreed to this is because I think it's funny watching my Photographer crawl around on the floor to take pictures of me. Thing 13: I was accosted by a wooden Duckie. AB Karen thought that the Duckie and I would be friends. (She was wrong.) But I was entertained as I got to watch first Karen, then AABs Christine and Britta, take turns pushing a flapping, waddling wooden Duck across the office while getting weird looks from Library customers. Thing 14: In lieu of a 14 Thing, I'm going to cross my paws and hit the Publish Post button and hope that all of my Handsome photos and evidence of Busyness don't blow up the Blogger site.